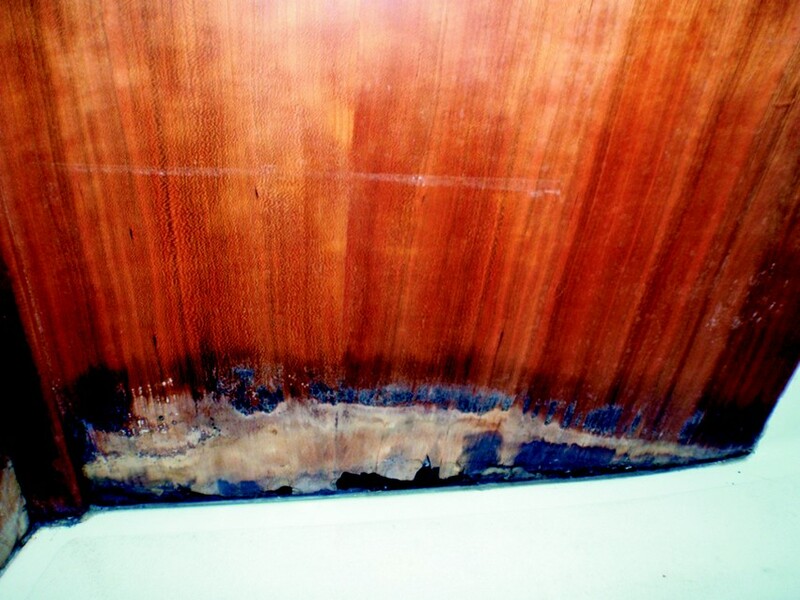 The following photos detail some recent repairs made by the owner and crew of Jester, a 2005 C&C 99. Jester is well equipped and has been meticulously maintained by her skipper and only owner, Greg Horvath. Jesterhas only sailed in fresh water and is stored indoors during the winter. She is also the boat I’ve raced aboard here in Saginaw Bay as well as around the Great Lakes including the Port Huron to Mackinaw Race and the Ugotta Regatta in Harbor Springs. The story of the repair process would not be complete without mentioning the outstanding customer service from the folks at C&C. Greg reports that from his first contact with a C&C rep throughout the entire repair process he was treated with respect and that he felt they were genuinely concerned about taking care of the problem. They provided, at no cost, enough parts and wood to complete three times the work Jester needed. They also supplied the exact same finish coating for the floor that they use in the factory. Some manufacturers won’t even tell you the color of the gelcoat they use but with C&C they were completely forthcoming with any information we needed. We appreciate good customer service here at GBI, so kudos to C&C! As the saying goes, a picture is worth a thousand words—so let’s get to it. 1. 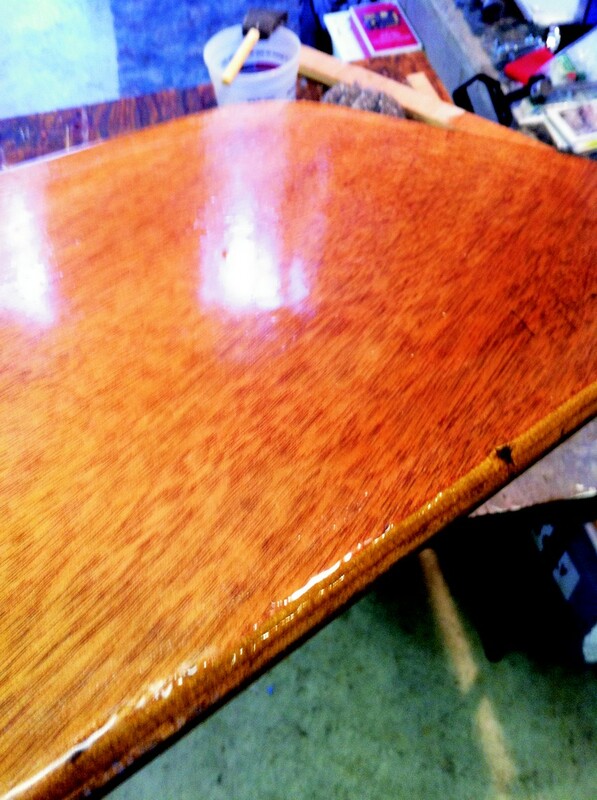 Moisture had wicked up through the cabin sole teak/holly plywood. 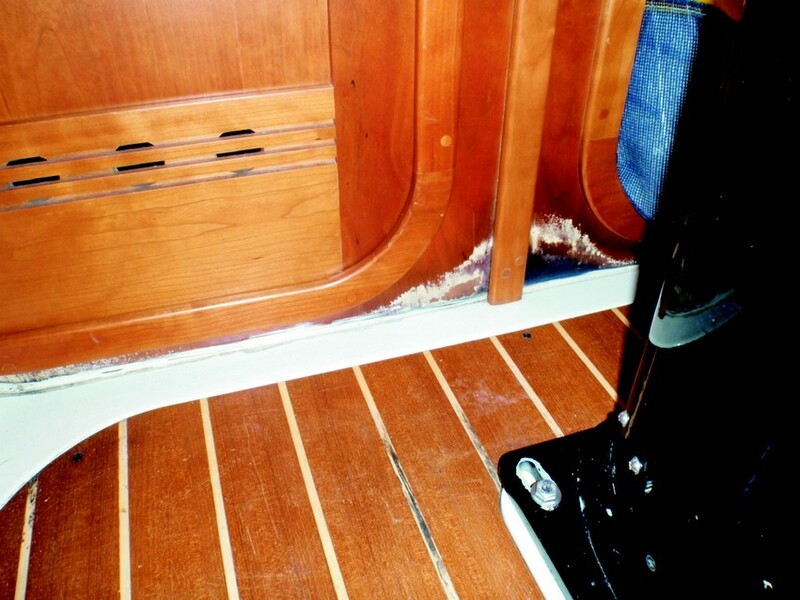 When the floor was removed, moisture was suspended between the sole and cabin sole plate. 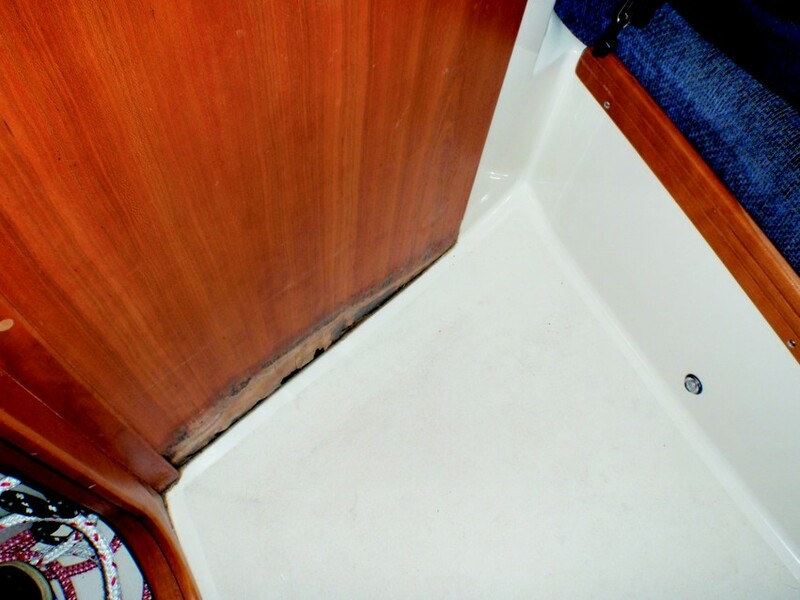 The cabin sole does not rest on typical floors, rather, it sits in a molded plate with drain holes that proved insufficient for complete draining into the bilge which caused the problem seen in this photo. Additional drain holes were cut before installing the new sole. head—the other is to the V-berth. Water which likely came from the anchor locker had wicked up through the sole to the bulkhead/sole gap. 3. 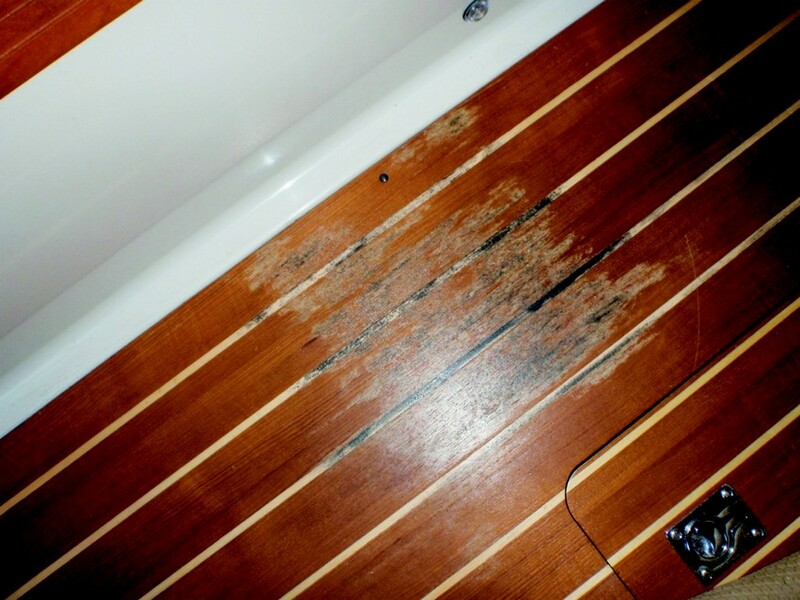 Complete rot -though in the aft cabin. Water dripped through the closed hatch during rainstorms.Note the halyards in the lower left corner. These can wick water down their length sometimes as well. The next photo describes the problem in more detail. 4. 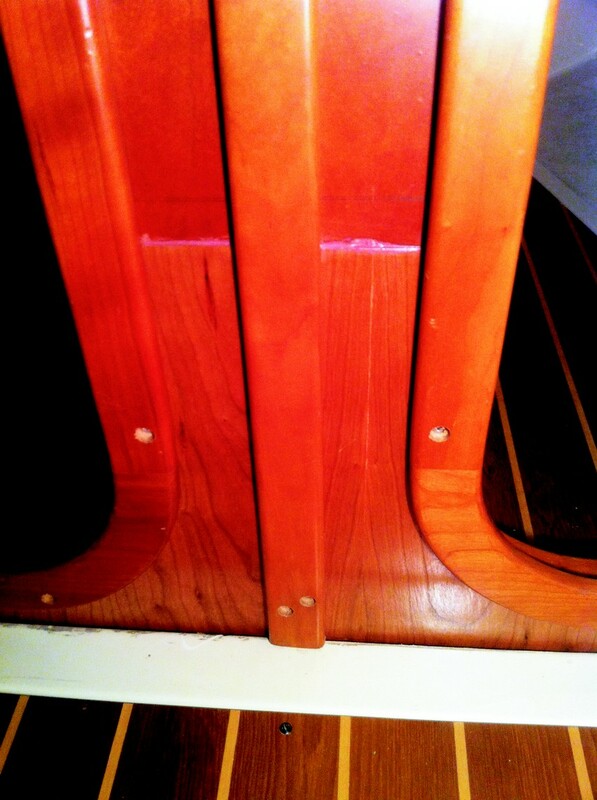 All the wood below the dotted line was removed.The cut was made with a saber saw set to create a shallow scarf angle. The actual cut was a straight line so the replacement piece could be easily cut to match.Sections of water damaged bulkheads were removed and new bulkhead material, supplied by C&C, was scarfed in. 5. New cabin sole undersides were coated with three coats of WEST SYSTEM® 105/205 as a moisture barrier.The end grain of new bulkheads was also coated. New material was stained with ML Campbell two-part stain used by C&C to match the original stain colors. 6. As you can see, the repairs were effective both structurally and cosmetically.Jester is now ready to head to Port Huron and beyond for our annual July racing extravaganza and we’ll be doin’ it in style.